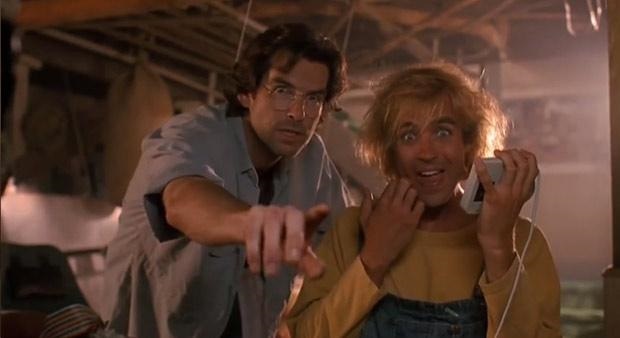 The 1992 horror/sci-fi hybrid, The Lawnmower Man, tells the story of two men. Dr. Lawrence Angelo (played by Pierce Brosnan) is a scientist who is experimenting with ways to make less intellectually inclined people smarter. Dr. Angelo is kind of a burn out. You can tell he has issues because he needs to shave, he’s always sitting in the dark, and he’s never without a cigarette. You look at Dr. Angelo and you just imagine that he smells like smoke, bourbon, and lost dreams. Jobe (Jeff Fahey) is the kind-hearted but intellectually disabled man who lives in a shack and spends his time mowing everyone’s lawn. Hence, he’s known as the …. wait for it …. THE LAWNMOWER MAN! Together, Dr. Angelo and Jobe solve crimes! No, not really. Instead, Dr. Angelo decides to experiment on Jobe. This leads to Jobe not only becoming smarter but also quicker to anger. Soon, Jobe is developing psychic abilities. He can move things with his mind. He can magically set people on fire. Basically, he can do whatever the script needs for him to do at the moment. Jobe is soon tormenting everyone who once bullied him. Father McKeen, the pervy priest, gets set on fire. Jake, the gas station attendant, is put into a catatonic state. An abusive father get run over by a lawnmower. Dr. Angelo knows that Jobe is out-of-control and that the experiment has to be reversed. However, the sinister group behind Angelo’s research wants to use Jobe as a weapon because …. well, because they’re evil and that’s what evil people did back in 1992. Jobe, however, has other plans. He wants to become pure energy so that he can rule over a virtual world…. Or something like that. 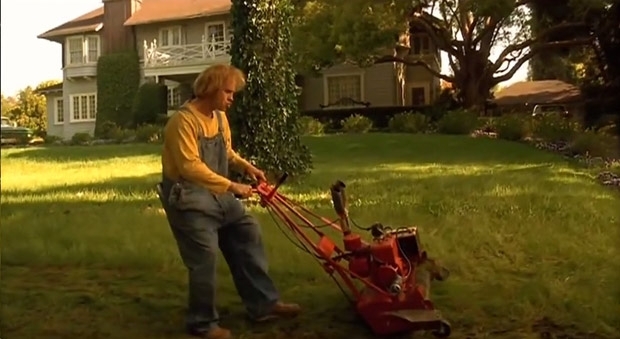 To be honest, it’s kind of difficult to really figure out what’s going on in The Lawnmower Man. The movie shares its name with a Stephen King short story but it has so little in common with its source material that King reportedly sued to get his name taken out of the credits. (Considering some of the films that King has allowed himself to be associated with, this is kind of amazing.) The film tries to be a satire, a slasher film, a conspiracy film, and a technology-gone-crazy film all in one and the end result is one big mess. 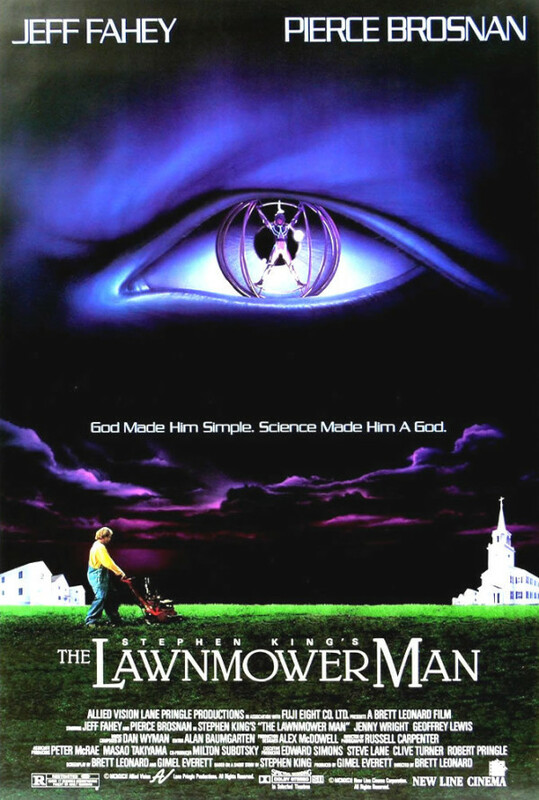 Along with all of that, The Lawnmower Man is also a time capsule of when it was made. A good deal of the film takes place in Jobe’s virtual reality universe, which looks a lot like a mix of Doom and Second Life. I imagine the film’s special effects may have seen impressive way back in the 20th Century but, seen today, they’re rather cartoonish, if occasionally charmingly retro. On the plus side, the film does have an interesting cast. Pierce Brosnan is never convincing as burn-out but he tries so hard that he’s still fun to watch. Underrated actors like Jenny Wright, Geoffrey Lewis, Dean Norris, and Troy Evans all get a chance to show what they can do in minor roles. Finally, you’ve got the great Jeff Fahey, giving a far better performance than the script perhaps deserves. 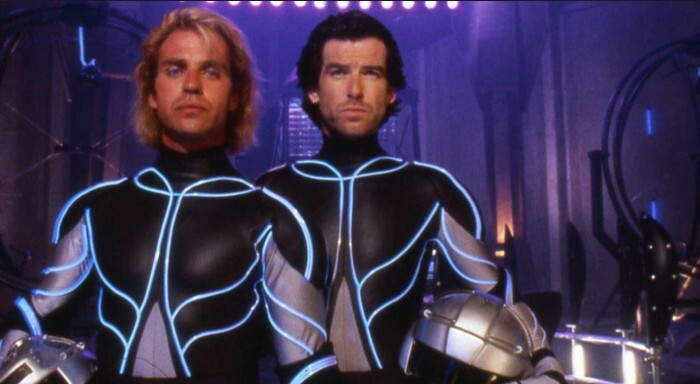 Though the film may be a mess, there’s something undeniably fun watching Jeff Fahey’s Jobe go from being meek to being a megalomaniac. It’s a silly film and not one that’s meant to be watched alone. This is a film that has to be watched with a group of your snarkiest friends. Watch it the next time you’re looking for an excuse to avoid doing the yard work.